Classic Slimline Bi Folds: our Slimline Aluminium frames offer narrower sightlines and profiles compared with PVC-framed products. We have installed made-to-measure bifolding doors since 2003, always striving to lead the way in door design technology. 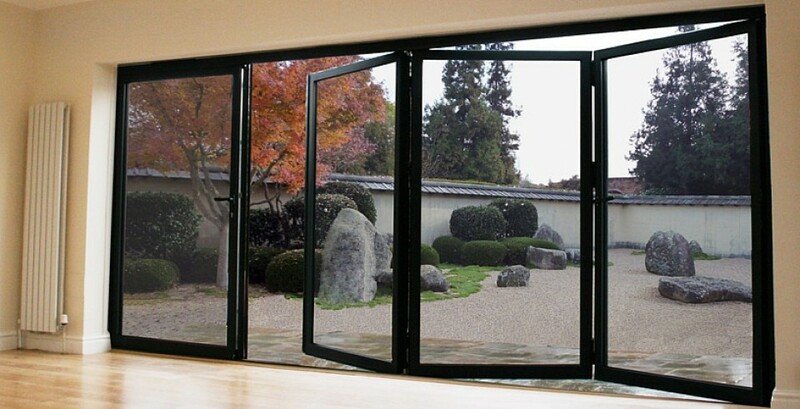 For more details, please see Classic Bi Folding Doors. 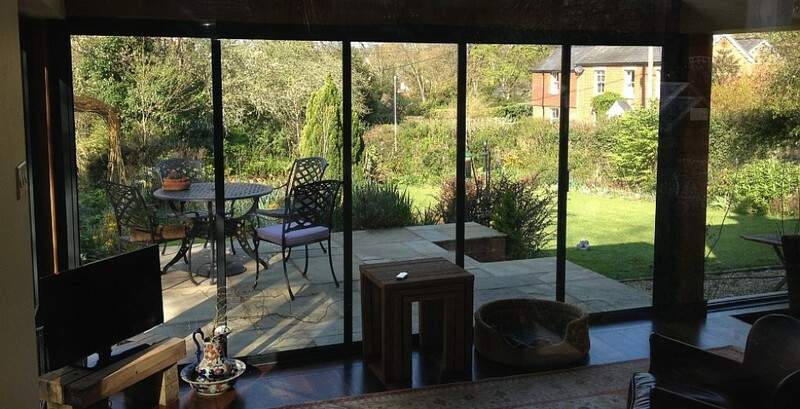 BiFolding doors come with k-glass as standard and are available with optional extras, e.g. 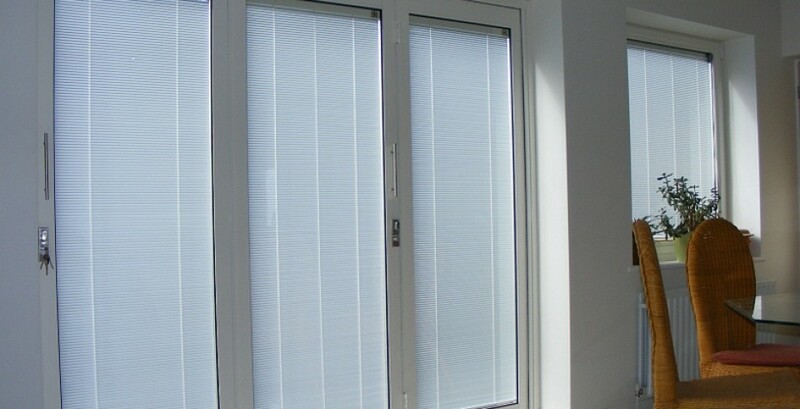 integral blinds, frame colours, special glass, etc. Can’t choose? 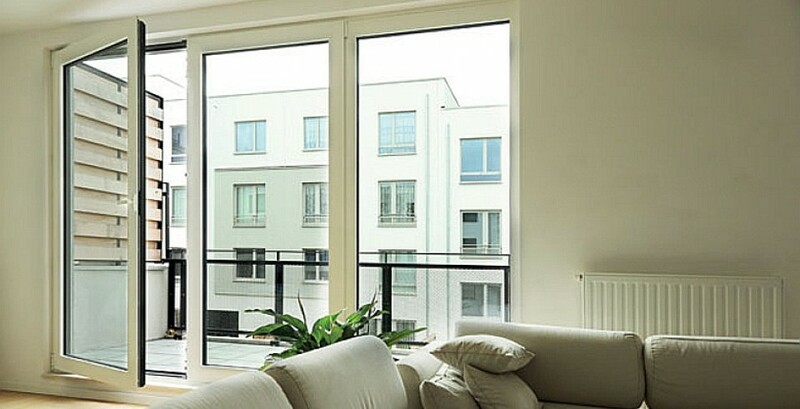 We can provide you with a quick, obligation-free quotation for our doors. 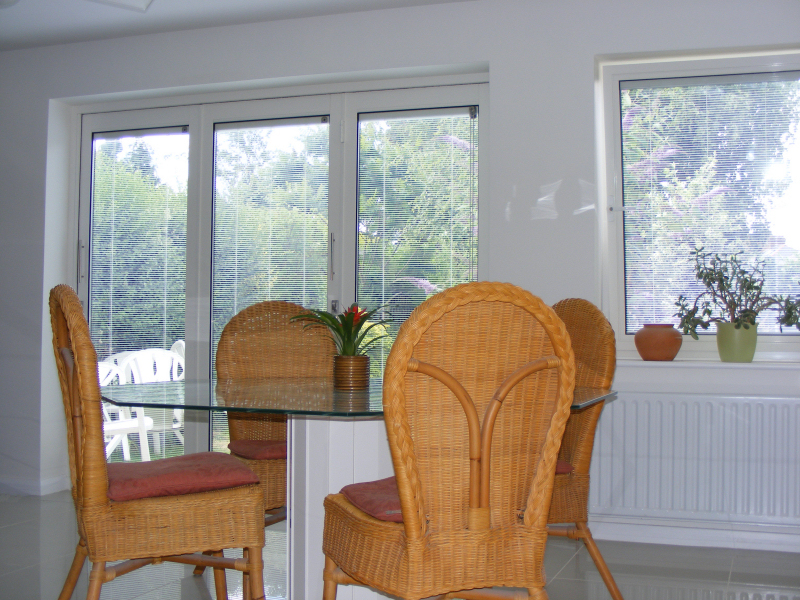 Double glazed units comply with Building Regulations and both British and European Standards (look for the ‘kite-mark’). Our BiFolding Doors are completely bespoke per client order, measured and manufactured to your exact size requirements. We have options to complement your colour scheme and can supply the doors with slatted blinds encapsulated within the glazing (see image – click to enlarge) if required. In addition to bi-folds, SunSeeker Doors offers Slide-and-Turn, traditional sliding patio doors, Frameless Glass and Sightline extra-large glass doors. 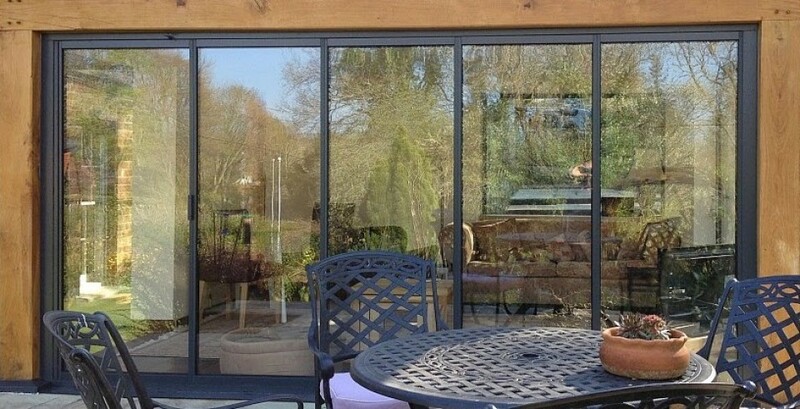 Any of our bifold and pivot doors may also be installed as French Doors. Bristol Architect Specifies Sunseeker Doors – Again! Mark, an architect based in the Bristol area, has specified SunSeeker Doors for his clients’ projects for more than five years.“Many thanks for the excellent doors and windows. They look great and . . .
"Just wanted to say how pleased we are with our doors and how very efficient the fitter was. Patricia" 11 June 2015 - frameless (4 panel) doors "We love our windows and doors, the fitters were excellent . . .
“AN EXCELLENT PRODUCT AND BRILLIANT SERVICE” Mark Guy, Parabola, Bristol “LOOKS GOOD VERY TIDY INSTALLATION” Paul B, Wilstead, Bedfordshire “THANK YOU – VERY EFFICIENT AND DOORS LOOK GREAT!” . . .
We had a small problem with the lock on our bifold doors and the Sunseeker reps who came out could not have been more helpful. They fixed it for us with no fuss, were friendly and gave us really useful . . . Sent: 05 April 2019 15:36 To: Sunseeker Doors Subject: Re: appointment Good afternoon Sunseeker Doors Just a line to say how pleased we are with our new doors and the pleasant and professional conduct . . . Sent: 05 October 2015 10:24 Subject: Beautiful doors Morning Tony & Paul, The doors look great - thank you! We have had lots of admiring comments already and I gave your details to an interior designer . . .
... the doors look fantastic from the inside. Our doors and windows … AMAZING!!!!!!!!!!! "Just to let you know – our doors and windows were installed today and they look... AMAZING!!!!!!!!!!! We are totally thrilled! Thank you – its been a pleasure dealing with you." Sent: 19 August 2015 07:30 To: Sunseeker Doors Hi Paul. The lads did a great job with the doors very efficient and clean workers We are very pleased with our lovely view of our garden now. Sent: 12 March 2018 12:45 To: Sales at Sunseeker Doors ... I would also like to add that we love the doors, they are fantastic! Sent: 22 June 2017 15:40 To: Sunseeker Doors Just wanted to say that Sue and I are delighted with our new doors. They look amazing and such a huge improvement from the original fitting and a huge relief . . . Sent: 21 September 2017 12:53 To: Sales at Sunseeker Doors I just wanted to say what a sensational job you did yesterday at my home – the frameless doors look amazing – and lovely installers too! Thank . . . Sent: 04 July 2017 15:38 To: info@sunseekerdoors.co.uk Subject: Service request Hi, Many thanks for your speedy response to my service request. The problem was quickly sorted by your technician, he did . . . Date: Fri, Feb 2, 2018 at 12:05 PM Subject: Thank you! I just wanted to drop you a note to tell you how thrilled we are with our doors - they are amazing! We are so happy - the service ever since we contacted . 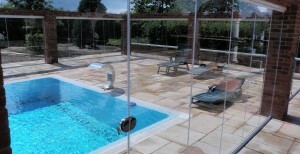 . .
Posted on Facebook: 9th September Just had sunseeker slide and pivot doors installed and are really really happy! 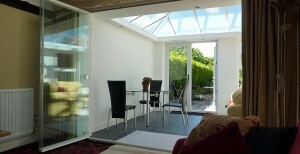 Look neat, let in lots of light and was a no hastle installation from start to finish. . . . Date: 9th May 2016. Hi Tony, Having had the 4 metre, 5 panel Ultraslim sliding pivot doors fitted 15 months ago, and experienced all the seasons, it is a great pleasure to thank you and all your staff . . . Sent: 11 August 2016 15:21 To: Sales at Sunseeker Doors Dear Tony, I am delighted with the new bifold doors; they look amazing and have really opened up the garden for me. My neighbours have just seen . . . Sent: Tuesday, October 3, 2017 10:30:22 PM Subject: Re: Installation Dear Paul, Just wanted to say thank you for arranging for Robert to come last Saturday and fit our glass doors. He did a very . . .
... SunSeeker for a job well done. The doors are just as good as we would hope and have been installed very well. Your installation team were first class. To me, the measure of a company is how they . . . Sent: 18 July 2015 14:15 Subject: Re: Sunseeker doors revised frameless single glazed quotation request. Dear Paul and Tony, I wanted to extend our utter thanks for sending us Adrian and his buddy today, . . . Sent: 21 September 2016 12:38 To: Sales at Sunseeker Doors Client Happy - thanks for coming back to do it again - its good to know that there are companies out there who care about doing a proper job Best . . . Sent: 16 November 2017 15:45 To: sales@sunseekerdoors.co.uk Subject: Feedback on after sales Re your after sales visit on 2 November. I would just like to say thank you for the prompt and friendly service we . . . Sent: 13 October 2018 19:55 To: sales@sunseekerdoors.co.uk Subject: Thank you Just a quick note to say thank you to you and your colleague for servicing our kitchen doors - it's made a real improvement. Admiring the doors and playing with them! We had to share this email! Date: Wed, Jul 1, 2015 at 7:48 PM Subject: Re: FW: RE: RE: SunSeeker Doors Quote Request (UK) from Website Hi Tony I just wanted to thank everyone at Sunseekers for a smashing . . . Date: 14th June 2016. Having had SunSeeker Bifolds for several years (Xmas 2007ish?) we hesitated to get in touch when we began struggling with the locking system last month. Even though it was long after . . . Sent: 03 October 2017 13:43 To: 'Sunseeker Doors' Thanks for sending the engineer. He managed to sort the problems out and advise on what do in future. I thought he had a great manner and was very polite. "Apologies for not sending this email sooner but thought I should just drop you a quick note to say how happy I am with the doors you manufactured. The fitters were also very good. … FYI I have also . . . So very pleased with my frameless room divider. I was nervous about paying up front for the installation but the two men who came to fit the glass curtains were exceptional in both their work and it . . . Sent: 03 November 2016 09:09 To: Sales at Sunseeker Doors Hi Tony and Paul, This is just to say a huge thank you. The doors are fantastic and your fitters were brilliant, diligent and professional.